As the moon moves into Taurus, and the sun into Leo, my mind gazes to the empty bowl of sugary grapefruit slice candy, and wine gums beside me. Again, another Monday looms with resolve to “eat right” and clean up my act. Best way to tackle this is to cook in advance. More often than not, I fool myself into thinking that I will be able to prepare breakfast and lunch just before I leave for work, and other than my token apple-a-day, the rest usually sits unprepared in the fridge. But not this week! This week, it’s Eat Like A Vegetarian Who Eats Chicken week, and I’m kicking it off with steel cut oats for breakfast, followed by fresh fruit, and a lunch of lentil dahl and brown rice. Supper will be chicken breast cooked in olive oil, oregano, mint and lemon juice, served on brown rice, with a side salad. Yum. Yum. 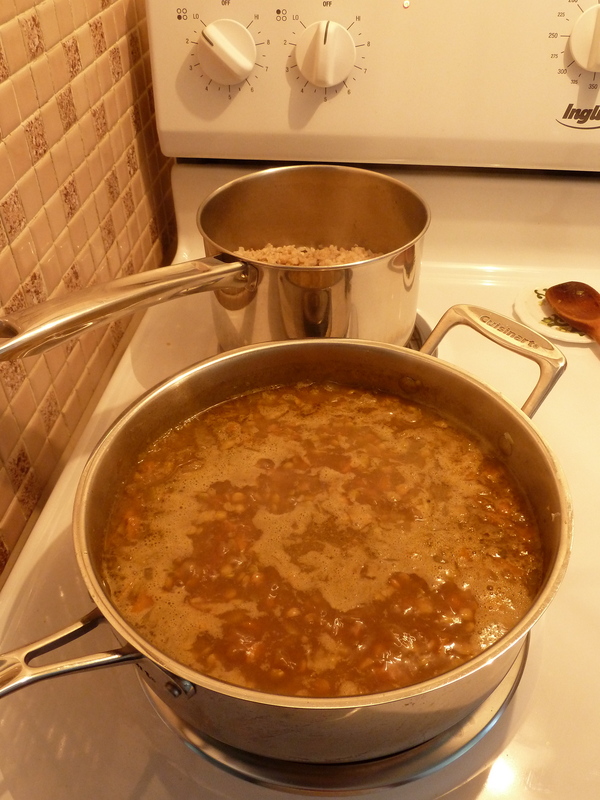 Lentil dahl, my version, couldn’t be easier. 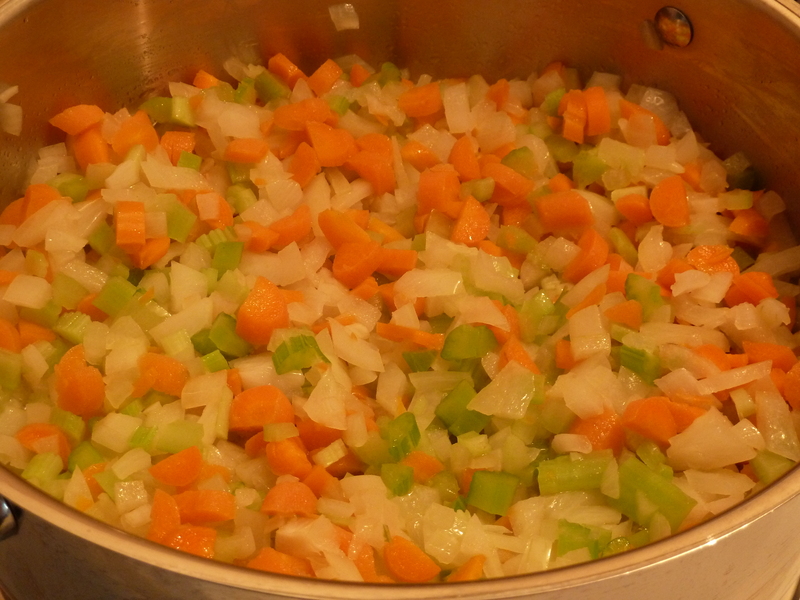 Start with your holy trinity of onion, carrots and celery. Saute until soft. Add garlic, chopped ginger (I use the jarred stuff, my being can’t chop ginger into fine enough pieces). Add generous spoons of curry and cumin. Add enough boiling water or vegetable stock (I use Knorr Vegetable Stock Mix) to cover generously. Hard to measure this, but I would guess about 2.5 cups worth. Add 2 cups green lentils. Salt and pepper taste. Let the whole works simmer on the stove for about an hour. In the end, you should should have something that looks like the above. In the background, you see a pot of brown rice. Enough to last me the week, since my dear husband will not eat brown rice unless disguised as white rice. I hear that double-double chocolate cheesecake brownies go GREAT with lentil dahl.